SALT LAKE CITY — MRI scans of patients who have Alzheimer’s disease show that playing songs with personal meaning to them activates parts of their brain that still have a semblance of memory retention, researchers at University of Utah Health say. “No one says playing music will be a cure for Alzheimer’s disease, but it might make the symptoms more manageable, decrease the cost of care and improve a patient’s quality of life,” said Dr. Jeff Anderson, a professor of radiology and imaging sciences at the U., in a prepared statement. U. researchers recently carried out a study on the topic of music therapy for such patients, beginning by spending three weeks to help “participants select meaningful songs and trained the patient and caregiver on how to use a portable media player loaded with the self-selected collection of music,” explained Stacy Kish, science writer for University of Utah Health. An MRI of a brain is pictured at the Imaging and Neurosciences Center in Salt Lake City on Friday, Dec. 28, 2018. U. researchers found MRI scans of patients who have Alzheimer’s disease show that playing songs with personal meaning to them activates parts of their brain that still have a semblance of memory retention. “The researchers found that music activates the brain, causing whole regions to communicate. By listening to the personal soundtrack, the (brain’s) visual network, the salience network, the executive network and the cerebellar and cortico-cerebellar network pairs all showed significantly higher functional connectivity,” Kish wrote. “Language and visual memory pathways are damaged early as the disease progresses, but personalized music programs can activate the brain, especially for patients who are losing contact with their environment,” Foster said in a prepared statement. Dr. Jeff Anderson, a professor of radiology and imaging sciences at the University of Utah, preps an MRI scanner at the Imaging and Neurosciences Center in Salt Lake City on Friday, Dec. 28, 2018. U. researchers found MRI scans of patients who have Alzheimer’s disease show that playing songs with personal meaning to them activates parts of their brain that still have a semblance of memory retention. Additionally, “activation of neighboring regions of the brain may also offer opportunities to delay the continued decline caused by the disease,” according to Kish. An MRI image of a brain is pictured at the Imaging and Neurosciences Center in Salt Lake City on Friday, Dec. 28, 2018. U. researchers found MRI scans of patients who have Alzheimer’s disease show that playing songs with personal meaning to them activates parts of their brain that still have a semblance of memory retention. Prior studies have explored how a personalized music program affects patients’ moods, and the results have been encouraging, but generally “people don’t really know why,” Anderson, contributing author on the study, told the Deseret News. He said that is why it is helpful to explore specifically the ways activity increases in the brain as a result of the music. While the new study focused on examining Alzheimer’s patients specifically, Anderson said, he doesn’t “necessarily have a lot of reasons to believe that most other dementia syndromes … (would) not behave similarly” in response to music. “When you put headphones … and play familiar music, they come alive,” said Jace King, a graduate student researcher and first author of the study. The study, first published in The Journal of Prevention of Alzheimer’s Disease in April, was carried out with the help of researchers from Jewish Family Services of Utah, University of Colorado, and Massachusetts General Hospital. It was funded with financial support from A. Scott Anderson, Zions Banks president/CEO and philanthropist, as well as the American Otological Society. 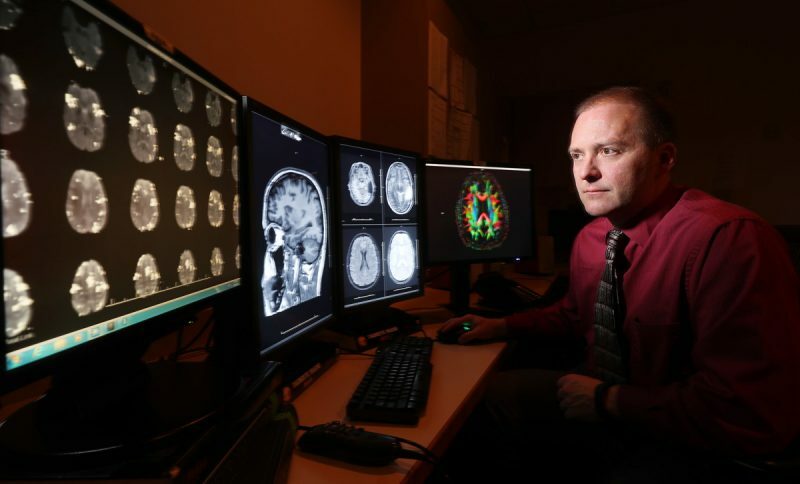 Central photo: Jeffrey D. Allred, Deseret News – Dr. Jeff Anderson, a professor of radiology and imaging sciences at the University of Utah, looks over MRI scans and images of a brain at the Imaging and Neurosciences Center in Salt Lake City on Friday, Dec. 28, 2018. U. researchers found MRI scans of patients who have Alzheimer’s disease show that playing songs with personal meaning to them activates parts of their brain that still have a semblance of memory retention.